The unit is designed as a load cart and can be outfitted to simulate varying refrigerant cycle components including false evaporator, compressor, condenser and expansion device depending on the test application. 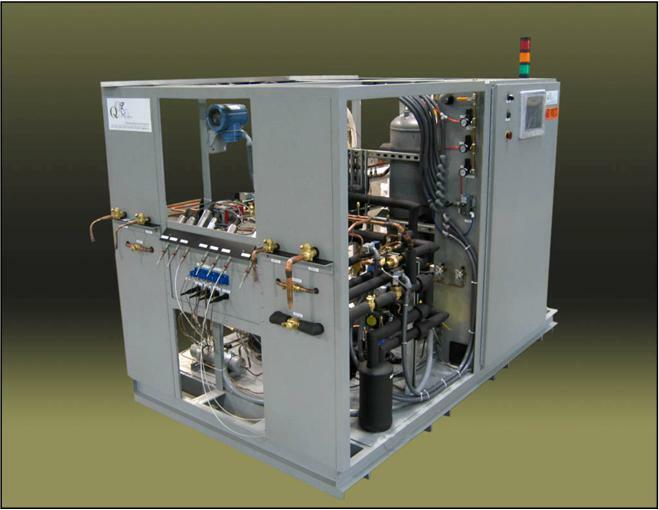 The RSM is capable of testing any/all refrigerant components to verify performance under simulated load conditions. The system can be supplied integrated with an airflow meter and data acquisition as a full condenser/evaporator calorimeter or it can be supplied as a cart that will integrate into your existing equipment. Two-2 different control systems can be provided which include a PLC based system with integrated PID’s, touch screen interface or a computer based LabVIEW system. The compressor can be electrically driven for HVAC applications or coupled to a drive and VFD for automotive applications. System operating ranges will vary depending on refrigerant and capacity of system. System can be supplied with a flush cart for to allow different refrigerants to be tested with the same unit.